The idea that she was “too western” to really make it as a lead actress mystifies me honestly, since she could and did look very Indian when she needed to. Her movie appearances were generally limited to one dance and that was sadly it; but she was a very natural actress too. She was the heroine in some B-movies opposite the likes of he-man Dara Singh (of wrestling fame) and had occasional small roles as a troublemaker or vamp (and, once or twice, the heroine’s friend) in more mainstream movies. Asha Bhosle was usually her “voice”, and they made a great team—like Shammi with Rafi, they would work together on how the vocals would fit the dancing. Helen made her exit as a dancer sometime in the early 1980’s when she was in her 40’s—and she still looked better (and danced better) than a lot of her younger rivals. Merchant-Ivory made a short film about her (“Helen, Queen of the Nautch Girls”) which is included on the DVD of Bombay Talkie*; I’m not a big Merchant Ivory fan, but it’s a great tribute to her at the height of her career. Youtube.com has dozens of Helen’s numbers for your viewing pleasure; and be sure to read Jerry Pinto’s interesting book on her career, “Helen: The Life & Times Of An H-Bomb”. Update: See a list of my favorite Helen songs and dances here! Posted on September 9, 2007 at 12:48 pm in Excellent Use of Helen, Hindi film history, Hindi movies	| RSS feed You can skip to the end and leave a reply. I am still not completely enamored of Helen, but that’s really because of her roles, not because of her. The whole item girl position in films is a little troubling to me, even though they often get great songs and a chance to do some fantastic performing. I haven’t thought too hard about it, though. I think I’m yet to see Helen in a role where she gets to do anything, though Teesri Manzil seems to be changing that at least a little. I wish I’d known who she was when I watched Mohabbatein. I love this post, and I love Helen. Beth’s reservations are completely understandable, but when I’m watching Helen my brain just turns off and I get lost in the fabulosity. Helen is completely sui generis. I love the pleasant surprise I got when I saw some of Helen’s very early appearances and discovered that she was also an outstanding classical dancer. In *Chalti ka naam gaadi* she danced a Kathak duet with her mentor and teacher, Cuckoo – and the student upstaged the teacher. I also saw her dance Kathak in *Gunga Jumna*. Yes, sometimes her dancing is more awe-inspiring (how does she DO that and not fall down???) than graceful, but she is graceful when she wants to be too…especially when dancing in the classical style or flamenco! Helen for me transcends the “item girl” tag, and honestly if I could be anyone in the whole history of Hindi films, it would be her. I will watch a movie just to see her dance. I FIND HELEN TO BE AN AWESOME ACTRESS/DANCER. I WATCHED HINDI MOVIES JUST TO SEE HOW NATURAL SHE BRINGS STYLE, GRACE AND SKILL TO ALL HER DANCE ROUTINES. THE OTHER ATTRACTION IS HER BEAUTY…RAVISHING I JUST LIKE TO WATCH HER LAUGH.I HAVE ALSO SEEN HER EXECUTE KATAK AND OTHER CLASSICAL DANCES EXPERTLY. I WAS ATTRACTED TO HINDI MOVIES BY JUST LOVING HELEN AND WHERE EVER BOLLYWOOD MOVIES SHE BROUGHT THE WEST TO THE EAST WITH HER DANCING. WHAT A FABULOUS LADY SHE IS OF INDIAN CINEMA. THERE IS NO OTHER LIKE HER WORLD WIDE. I have always looked forward to her appearance on the screen. She exudes a kind of freshness and drama to her dances. Helen flows and swims thru the various numbers and make them look like its her first time. 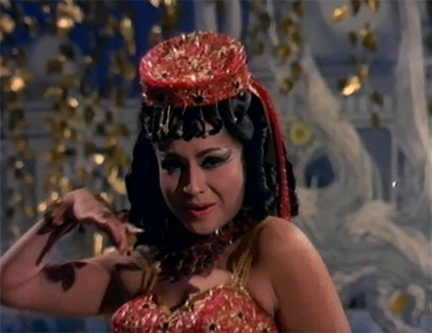 In particular, her dance match with Vijayathimala (Prince), pairing with Mehmood (Gumnaam) or the suppleness of her movements (Junglee) or doing the ballet (Teesri Manzil). Not only that, her potrayals are true and charasmatic in its own way, let it be it her parts were small. I was pleasantly surprised by her appearance and agilibility in Mohobatien. Helen is a brand name for respectability, humility and talent; and that – no one can take away from her. I love Helen too :-) She is one of a kind, and can never be replaced! Would’nt it have been cool if the impromptu rendition was “Yeh mera dil pyar ka deewana” from Don… No points for why that would have been funny. 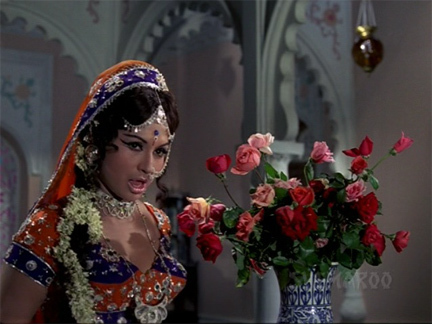 HELEN IS AND REMAINS BOLLYWOOD RULING ICON/PASSION…I LOVED THE INDIAN CINEMA AND DANCE STYLES OF THE 60’S-70’S. THANKS TO HER I LEARNT A LOT MORE OF INDIAN CULTURE, BOLLYWOOD AND THE OTHER FAB STARS OF THAT ERA. CHEERS INDIA..
I’ve seen a LOT of films I would never otherwise have found, except that she was in them. She does rule over everything! seeing as memsaab and the regulars here are also huge “movie references in movies” fans, here is one relaed to Helen. Joe public have indeed watched movies just for that Helen number. Oooh, good one! :) I wouldn’t want to miss the Helen song in any film, especially since it was often the best part! Memsaab, if you haven’t seen this (new on Youtube) I think you will like it. Both Helen and a handsome Shammi are featured. Agreed. Helen is just Helen. Just like Cher. No other name is required. But have you noticed, so is Pran? If Helen is the consummate nautch/dancer girl, Pran is the consummate villain in many a movie, trying to make the hero earn his pay. Dev is Anand, Raj is Kapoor, Dilip is Kumar; but Pran is just Pran – even if in many instances he is out to extract the “praaN” from the lead character. Helen is the nautch diva numero uno! to label her as an item number is to downgrade or trivialize her art, her craft, her passion, her sensuality, and her contribution towards the overall scheme of things. she is a very competent actress as well whenever she was given a sizable role on screen. Two Helen songs I love to love – Mera Kya Sanam from Talash (though Mahendra Kapoor steals the song from Asha Bhonsle) and Lavleena Aa Gaya Main from Agent Vinod. Helen played Shashi Kapoor’s sweetheart in Duniya Meri Jeb Main (if memory serves me right) and Amitabh’s GF in Imaan Dharam, wait, there’s a marriage scene too. 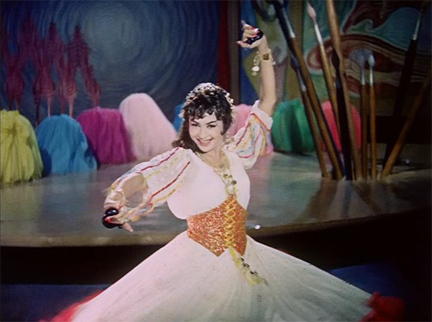 Helen along with Vyjayanthimala are probably the only two actresses in bollywood who I think can really dance. I think the reason why she was sidelined to supporting roles and a 5 min dance is due to her looks. Especially when she began wearing those elaborate reddish and blonde wigs in the early 60s, she looked ‘foreign’ or totally different from what she used to look like during the 1950s. This might have contributed to the sidelining in my opinion. Yes Helen. Simply Helen. I also liked your choice of Helen songs. Thanks for sharing.